Observation - Unknown moth - UK and Ireland. 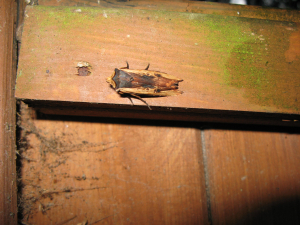 Description: Brown, medium/large moth, (3-3.5 cms long), camouflaged to look like a small piece of twig. On side of chicken hut, looking to hibernate? Brown, medium/large moth, (3-3.5 cms long), camouflaged to look like a small piece of twig. On side of chicken hut, looking to hibernate?